-I could wear a white v-neck tee every day of my life. To me, they are a definite staple to any closet and also super versatile. -I love that you can play with fun accessories to change up the look of one. -You can wear one with a cute scarf, or a chunky statement necklace. Wear a cardigan over it, or a blazer..
Get yourself a good v-neck white t-shirt if you don't already have one. You will thank me. Oh and then tell me where you got yours cause I'm always in search of the perfect one. In fact I have probably collected too many in search, but it has to be just right...The right length, the right sleeves. Not too fitted, not too loose. One that will keep it's shape all day and not get all stretched out and raggedy looking. Boyfriend Jeans: Old Navy about 2 years ago! also, these jeans? not sure they are the most flattering on me, but they are super comfortable so that tidbit won over flattery this time. My mom always taught us that beauty is pain, but sometimes you just gotta go with comfort, amen? Amen. jeans and a v-neck. always a go to. always perfect. a white v-neck or scoop neck is on my current "need to find" list! target has one that is pre-shrunk and so soft-and only $8! may have to get that one. also jcrew factory has some great ones! This just seals the deal that we were meant to be best friends. Oh and just counted and I have 8 white v-necks in my closet. My favorite is one from walmart years ago... haven't found one that compares yet. But as you can imagine it's kind of gross. It's kept for bedtime only now. Oh and I love the jeans by the way. I'm needing to find a pair that looks like that... something casual. LOVE your look! Thank you for reminding me....time for a new white T. Maybe I will check out Ann Taylor Loft or Gap...TJ Maxx... And, I do love those jeans. I'm prob more your mom's age. Comfort wins :)Thanks for sharing...enjoy your day! a little on the pricey side, but J.Crew. Soft, washes well, good length, not too tight, not too loose. I've found that sometimes paying a little more for the quality and fit is worth it. I wear them out. Love this look! It looks so comfy and adorable! 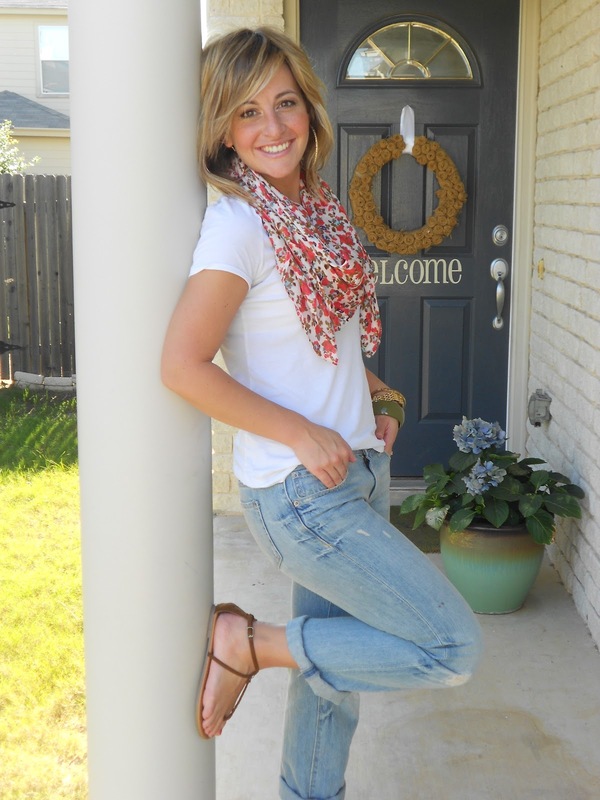 That scarf is darling, and so are the sandals! You are a doll, as always! I am obsessed with white and block tees! And of course,I need new ones as we speak. The jeans are perfect and the scarf is gorgeous. Also,my 4 year old just pointed to the screen and said "who's that?" love it, as usual. your style is so cute! btw - i sent you a personal email about a week and a half ago about guest posting for me during my event MAYspiration next month on my blog. I'd like you to share Project Hope with my readers, if you are willing. :) Did the email ever come through? Jcrew and GAP! I have the same obsession! I just realized! I have the same welcome mat. Love it. =) You look adorable. Oh my goodness. I have never found someone that shares the same obsession with white tee shirts! I am always searching for the perfect one..I think I own about 6 at the moment. My favorite one is from Nordstrom Rack for like $14 bucks! I am a new follower, you have a cute blog. Great job on the running. I started running last year, but have had trouble with my knee and hip, so we will see how long I keep it up. You are so ADORABLE!! You look chic and effortless! I have THE HARDEST time sporting a white tee!